History changed on November 4, 2008 with the election of Barack Obama, the 44th President of the United States-and the nation's first African-American Commander-in-Chief. The American Historic Society has captured this moment forever in the Historic Victory Plate: the limited editionfine porcelain heirloom to commemor ate the night that America found hope and welcomed change. A true piece of history-and a family treasure to be prized for generations to come-this plate is the first of its kind and created during one of only 65 firing days. After that, no more of these priceless works of art will ever be made. 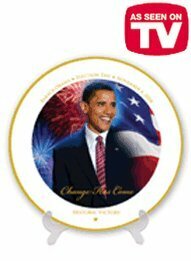 Designed by artist Roger Cunningham in quality porcelain and trimmed in rich 22K gold, the front of the plate is inscribed with the election date and the words "Change has Come." The back of the plate bears the seal of the American Historic Society, which marks its importance and integrity, and features the historic popular and electoral vote totals. A beautiful display stand and Certificate of Authenticity are included. For decorative purposes only. 8". Imported..